Alastair Cook celebrates his century on his final Test appearance against India at the Oval. Alastair Cook’s final Test century, an emotional 147 at the Oval against India in September, has been shortlisted for BBC Sports Personality of the Year’s Greatest Sporting Moment of the Year award. 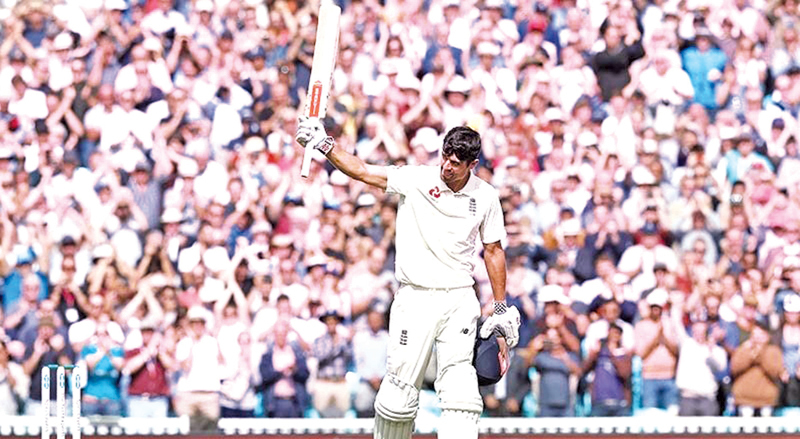 Cook, who announced that the match would be the last of his illustrious Test career beforehand, drew a rapturous standing ovation from the crowd upon reaching his 33rd and final Test century in England’s second-innings. It had appeared that the opportunity of a perfect farewell had passed him by when he fell for 71 in the first-innings. Nevertheless, the left-hander was able to bow out in style with a typically battling knock in his second dig at the crease, reaching three-figures in front of a packed house. The former England captain waved goodbye as England’s leading run-scorer in international cricket, helping his side to a 4-1 series win over the visitors. Cook’s century faces competition from England Netball’s gold medal at the Commonwealth Games, England’s penalty shootout win over Colombia at the men’s FIFA World Cup, Tiger Woods’ win at the Tour Championship, and Tyson Fury’s fightback from two knockdowns against Deontay Wilder.